This is a research paper written by Rebecca Johnston, Daniel's sister. She recently graduated from a Physical Therapy degree program, and wrote her Capstone paper about Daniel's stem cell therapy treatment in Panama. Daniel is presented anonymously in the paper, but Rebecca and Daniel have given their permission for this paper to be shared. Daniel's ASIA scores (pre and post treatment) are in the appendix of this paper. "After the patient underwent the stem cell treatment and returned to outpatient physical therapy in his hometown clinic in the United States, his MMT scores were tested over the period of 5 months post-stem cell treatment.... The patient did not decrease in strength in any of the muscles tested, and experienced improvements in 6/13 upper extremity muscle groups, and 8/9 lower extremity muscle groups." "The patient also had an increase in grip strength. His grip strength was measured by his occupational therapist to be 5 lbs on the right and 25 lbs on the left at one month before his stem cell treatment. Six months later, his grip strength was measured to be 22 lbs on the right and 36 lbs on the left. The patient reported that this increase in grip strength led to functional improvements, such as being able to self-catheterize, which he was completely unable to do since his injury." "The patient was also able to ambulate for the first time in 5 years at approximately 4 months after finishing his treatment. He was able to ambulate in partial weight bearing with the harness and max assist of two for 40 yards at .5 MPH. " Before going to Panama, Daniel's grip strength was 5 lbs in his right hand, and 25 lbs in his left hand. His most recent test results show that his strength has increased to 22 lbs in his right hand, and 36 lbs in his left hand!! This additional strength is really expanding the range of what he can do with his hands! Overall, we've been please with Daniel's results, and definitely feel like the therapy has been worth it. The results have not been super dramatic, but we were never led to expect dramatic results. We were hoping for improvements, and we've seen enough improvements to satisfy us this time around. He's a lot stronger all over his body - we've only had ASIA testing done on the lower half of his body so far (I need to post the results, I know), but he had increased scores in five muscles. He's a lot stronger as well in his core and arms. Since he's returned, he's been working on the tilt table in physical therapy - he's finally made enough progress at being able to tolerate being upright that they recently started LiteGait therapy for him (I will post video/photos soon). His hand grip strength has significantly increased. He has cut down on his medication - he's taking a reduced dose of his pain medication, and has almost completely stopped taking Baclofen. He still gets a lot of muscle spasms (especially now that he's taking much less Baclofen), but can stop them himself. He used to use nasal spray constantly, but lately has had very little need for it - not sure exactly what to attribute this to, but it's great that he can breathe better! Also, please feel free to email me at rahilka@yahoo.com if you have any questions about our experience or his results! He's getting a lot stronger in his trunk area - it's very exciting to see him sitting up alone on the mat, hands-free, especially while doing exercises. Our sister Becca is writing a paper for her physical therapy program about stem cell treatment, and she came across the following information about Baclofen in her research. Baclofen is an antispasmotic drug - Daniel's been on it since his injury, as are many other spinal cord patients. This information is very concerning, and we wanted to share it for anyone else that may be on Baclofen. This is from an article entitled " Restoring function after spinal cord injury: promoting spontaneous regeneration with stem cells and activity-based therapies", published in the journal Neurosurgery Clinics of North America, dated Jan 2007. "Three quarters of individuals with spinal cord injuries are treated chronically with antispasmodic drugs like baclofen, diazepam, and related drugs. Baclofen is a -aminobutyric acid (GABA) agonist and is know to reduce patterned neural activity in the brain and spinal cord dramatically. Based on this reduction in activity, the authors' hypothesis would suggest that reduced activity would inhibit spontaneous regeneration and recovery. Recent studies from our laboratory confirm this hypothesis (unpublished data). Baclofen profoundly inhibits cell proliferation, survival, and differentiation, particularly myelination. Furthermore, Baclofen produces irreversible loss of function. Therefor, considerable thought should now go into treating spasticity. Baclofen is not an extremely effective oral agent, and there is now evidence that it can harm by inhibiting regeneration and recovery. Furthermore, the authors have shown that patterned activity, such as FES bicycling is a better way to control spasticity than medications. 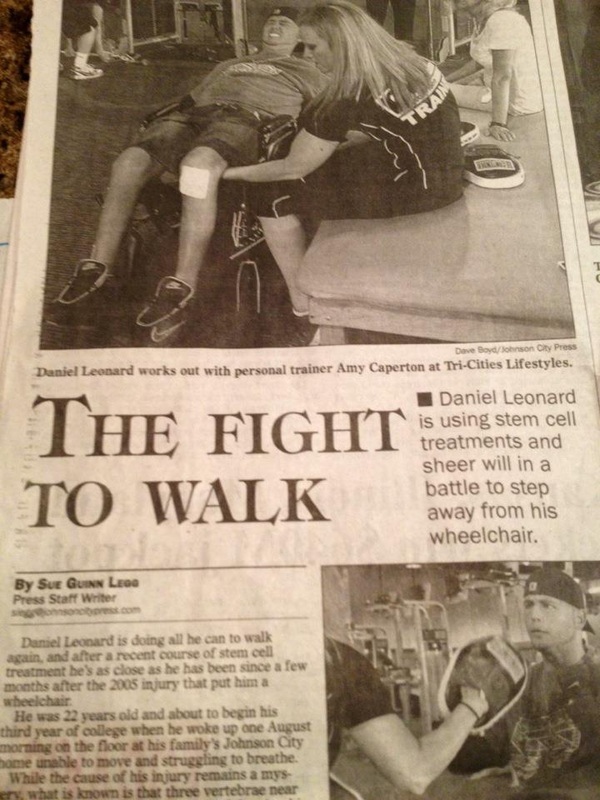 Check out Daniel in the Johnson City Press today! I wanted to do an update with the results Daniel's been seeing since we've been home. I will admit, first of all, that none of this is measured in any way (which would certainly be my preference - but we just haven't gotten around to do that yet, or to getting his ASIA testing redone yet). I promise something more quantifiable will come later, but I wanted to catch people up on what's happening so far. -In general, he's just feeling stronger overall. He feels like every couple days, there's a new muscle that works just a little better than it used to. It's still all little things, but they're building up. -When he is transferred from his wheelchair to his bed or another wheelchair, his nurses stand him up and pivot him, and then sit him back down in whatever he's being transferred to. Multiple nurses have mentioned since he's been back that he seems to have a lot more strength in his legs - he's doing more of the work to stand himself up - almost popping up (assisted, of course) out of his wheelchair during the transfer. -He has a lot of spasms, which are painful for him, and have always been uncontrollable (unless someone else physically puts pressure on whatever body part is spasming, to stop the movement) but in the last few days, he's noticed an ability to stop the spasm himself. It's not immediate, and he really has to concentrate, but it's certainly something he's never been able to do before, so it's pretty incredible to us. -He can flex his left thigh muscle hard enough to actually see the movement through his jeans - he had some strength in that muscle already, but he couldn't flex hard enough for it to be noticeable if he had pants on. -His right leg is still weak, but getting stronger. He was showing someone today how he could kick with it, and he was sitting in front of the table, and said, "Let me see if I can kick the table". That required him to kick at least 4-6 inches, and when he said that, I thought to myself, "There's no way he can kick that right foot that far" - but he did. Multiple times. -When he first started flexing his pectoral muscles, I couldn't see or feel anything when he did it - I was just taking his word for it, that he felt it. But when he did it today, I could actually see his shirt moving just a little bit as he flexed. Like I said, all little things - but all exciting things to us. PS As I was writing this, I was chatting online with his personal trainer about his results so far, and she commented, "I am trying to be objective but I must say he is making drastic improvements and it excites me:) "
We have a request for a breakdown of the trip costs, for others considering doing this. Our total costs were ~$44K. -We were there for five weeks because of the holiday, whereas the usual protocol for spinal cord injuries is four weeks, and for most other treatments 's two weeks, so rent and food expenses would be less for most people. -Over $1000 of the miscellaneous expenses are for medications - hopefully we'll get reimbursed for some of it by insurance, but we're not sure. For people who are only going for a month or less, and can time the trip better with when all of their medications are available for refill (rather than having to pay for refills so as not to run out, like we did), this amount could be a lot less. -Because Daniel normally lives in a nursing home, we had to buy a lot of medical supplies (e.g., bed pads) that are not part of our normal budget for the month, and we're counting those in our costs. For someone who lives at home and is buying these every week anyway, they wouldn't be an additional cost like they were for us. -Don't try to be too conservative in estimating your miscellaneous expenses. It's definitely going to be a lot more than food and taxis - we would not have ever guessed we'd be paying for things like wheelchair repairs in Panama, but unexpected expenses are definitely going to happen. I am a quadriplegic, and I am raising money for stem cell treatment in Panama. I will be updating this blog on my fundraising progress, and ultimately, on my treatment results.